Welcome to the Dream Team Steven Van Broechoven. What are you most excited about as a new Starboard member? My contract with JP came to an end, so it was time for something new. I´m happy that Starboard welcomed me in their dream team. Starboard is a great brand, always in for innovation and has an eco-friendly mindset. That fits me 100%! Have you ever been sailing on a Starboard board before? I got the chance to try it at the Boot Show in Germany, but looking forward to testing them in the real wind soon! What will be your role in the team? In 2019 I will mainly be a team rider, but in the future, I would love to be part of the R&D. 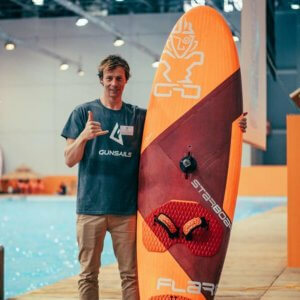 I´ve been speaking with Taty Frans and Remi Vila about the 2020 freestyle board, and the new design looks very interesting. 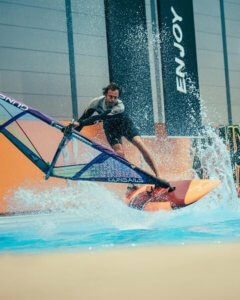 How did you get introduced to windsurfing, and what made you start freestyling? I always wanted to do something else than what most of the people were doing. I started windsurfing on a really small lake, and I fell in love with the sport from the beginning. Also the atmosphere and the positive vibe in this sport I liked a lot. I started competing at an international level ten years ago and became professional after my freestyle World Title in 2011. We have seen you been doing some foiling and slalom last years. Do you plan to do any competitions in those disciplines in 2019? My focus for 2019 is on freestyle and foil. Those 2 disciplines I can combine perfectly. I like both of them a lot. I don’t mind if it´s 30 knots or 10 knots, I will have fun! Which year was your best on the PWA Tour? 2011 was definitely the best! Not only because I became World Champion, but also because we had 7 freestyle tour stops; Vietnam, Austria, Bonaire, Aruba, Lanzarote, Fuerteventura and Sylt. That was a real tour! What´s your main focus/goals for 2019? My main focus will be on the PWA freestyle and foil competitions, and as many EFPT events as possible. Cape Town I still one of my favourites, but now as I’m doing foil as well, I prefer Tarifa in Spain. Dream destination (a place you never been to before)? One of those islands in French Polynesia, or somewhere there. On Google Earth, they look so cool! I´m dreaming of going foiling there. What is your advice to people who wants to start with freestyle? Never give up! The beginning is the hardest!